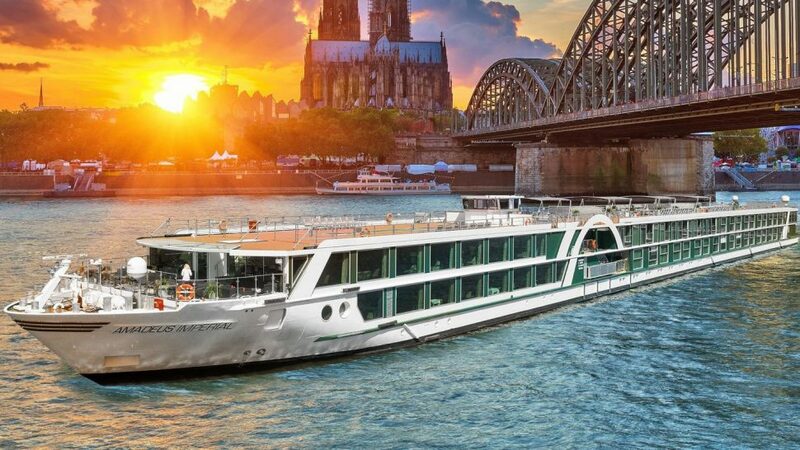 Tolkamer 24/04/2019 – Shipyard De Hoop is proud to announce her 15th order from Lüftner Cruises, this time a 135 meter luxurious river cruise vessel. The ‘Amadeus Imperial’, as the new vessel will be named, will be a sister-ship of the ‘Amadeus Silver III’, delivered by De Hoop in 2016. The ‘Amadeus Imperial’s delivery is planned for the spring of 2020. Tolkamer 24/04/2018 – Last week, the design of our yard number 489, the Silver Origin was revealed. The initial reactions have been very enthusiastic, we are proud to be the engineer and builder of this vessel and we value the close cooperation with the designers and our clients to realize such a wonderful vessel. 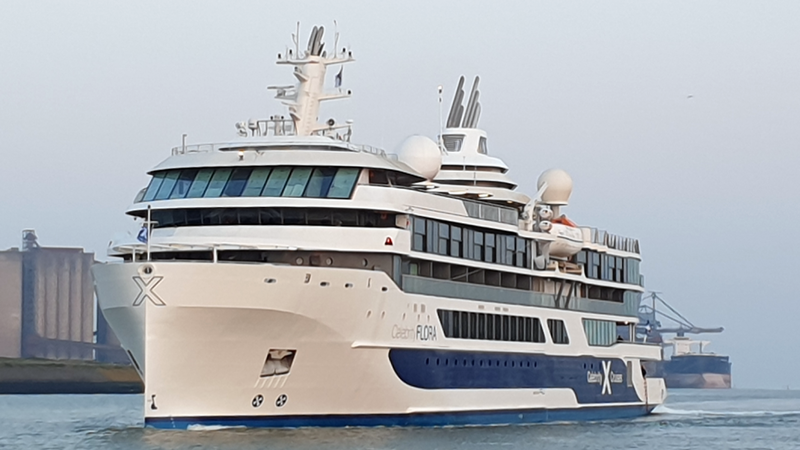 North Sea, 15/04/2019 – Last Saturday, Celebrity Flora started her Sea Trials at the North Sea. Maneuverability, speed and Safety are some of the features that will be examined. 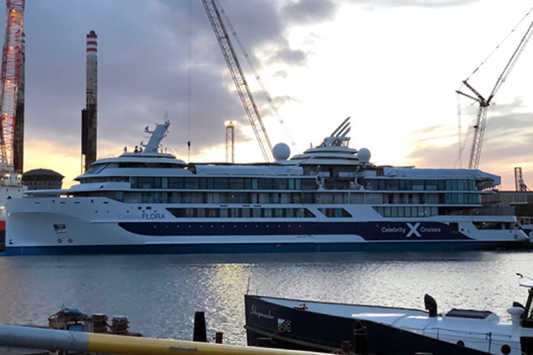 After three days at Sea she will return to Schiedam later today where she will be completely outfitted before she will be delivered to ‘Celebrity Cruises’. 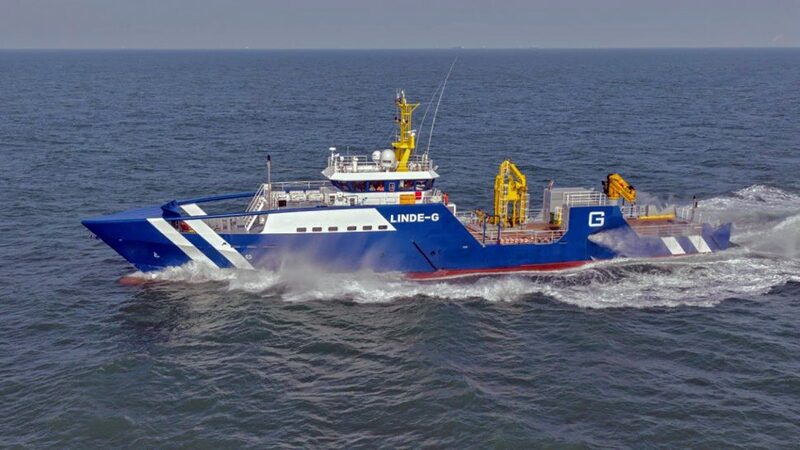 Tolkamer 12/04/2019 – Multifunctional Support and Chase Vessel ‘Linde-G’ has successfully delivered to Shipping company Groen in Scheveningen. The vessel-design is based on the hybrid propelled FSIV designs from De Hoop (nominated as “Ship of the year in 2014”) and with this, the design shall be very fuel efficient. This very innovative vessel is equipped with a Hybrid Propulsion System with 3 modes (Diesel-Electric Slow mode, Diesel-Electric mode and Diesel-Direct mode). Besides the functionality as a chase vessel, the work deck shall also be equipped with a 12 Tons Vestdavit for a large workboat and a crane shall be added with over 19 meter reach to allow a wide variety of services. 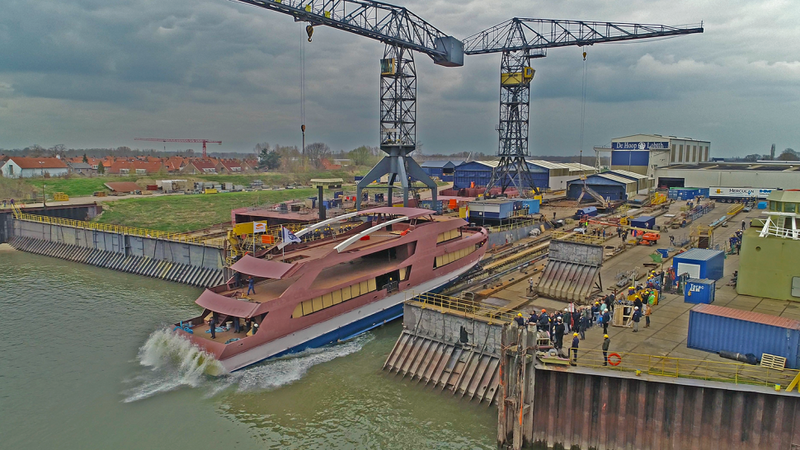 Tolkamer, 28/03/2019 – Today, at 15:00 PM the hull for the new day passenger & event vessel for Spido has been launched successfully. The main lines of the design, made by Cor D Rover, are becoming visible. The launch went smooth and the vessel is now moored in the fitting out harbor of the Lobith yard, where the further fit out and finishing shall take place. Delivery is scheduled in the second half of May. 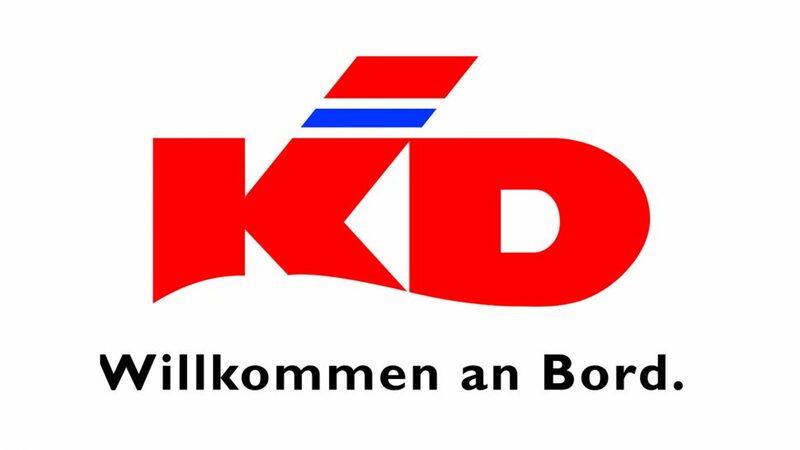 Tolkamer 28/03/2019 – Shipyard De Hoop is proud to announce a new order, this time from returning client ‘Köln-Düsseldorfer Deutsche Rheinschiffahrt GmbH’ (KD). The vessel is a newly designed entertainment/daypassenger ship for groups up to 1000 people and shall be built under yard number 493. De Hoop and KD have a long history, whereby the vessels Rheinenergy & Rheinfantasie were the two latest deliveries. 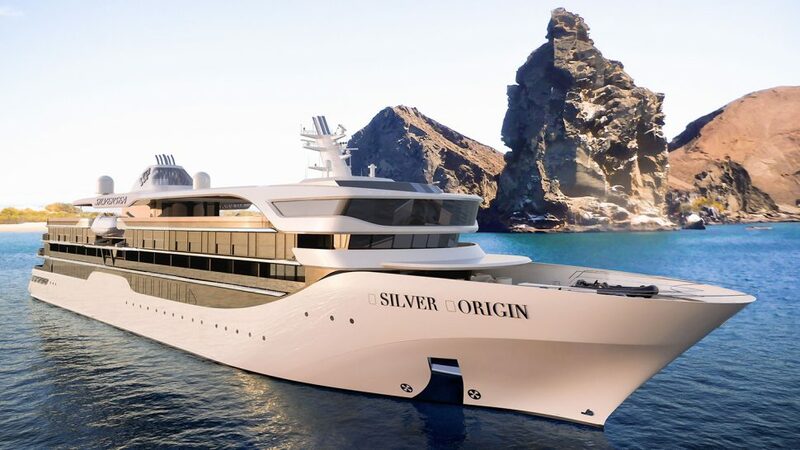 Following the successful performance of these vessels, the new concept is being further designed and detailed in close cooperation with yacht designer René van der Velden and engineering company Schiffstechnik Buchloh. The design shall have a special focus on the entertainment-operations (parties, events, etc.). Combining the experience of the two engineering teams (Buchloh/De Hoop) and a yacht designer, the aim is to build a stunning vessel, ready for many great events. North Sea, 26/03/2029 – Today the new build Multipurpose Guard & Support Vessel ‘Linde-G’ has successfully completed her speed and endurance trials. With 20 knots on the North Sea it was quite a spectacular ride. The vessel is today doing her DP trials and after completion the new Owner, Rederij Groen, shall swiftly commence her initial contract. 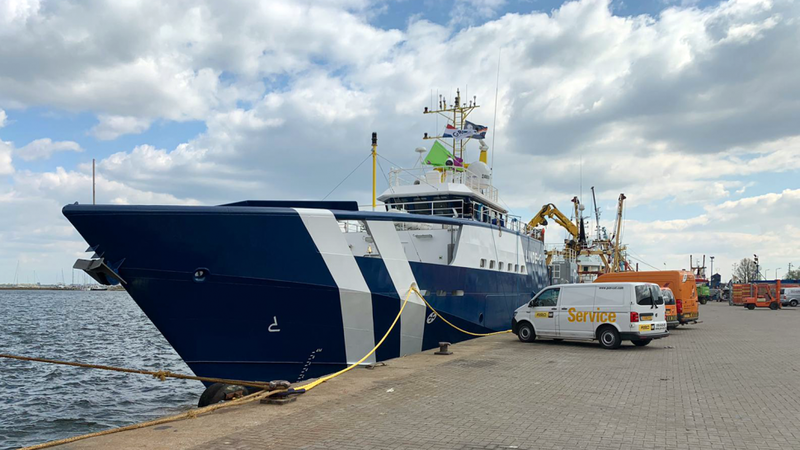 Schiedam, 24/03/2019 – Following a week in the dock, the Celebrity Flora is now painted and in her final stages of completion. Many of her innovative systems are now being commissioned one by one. Sea trials are planned for 5-7 April and after that she shall be finished and prepared for the Atlantic cross-over. Tolkamer 21/03/2019 – Linde-G, the new Multifunctional Support and Chase vessel for Shipping Company ‘Groen’ is in the final stage of preparation before she will start her trials next week. After successful trials, the delivery date will be March 29. Tolkamer 12/02/2019 – Shipyard De Hoop is proud to announce two orders for a Special Mission Vessel. 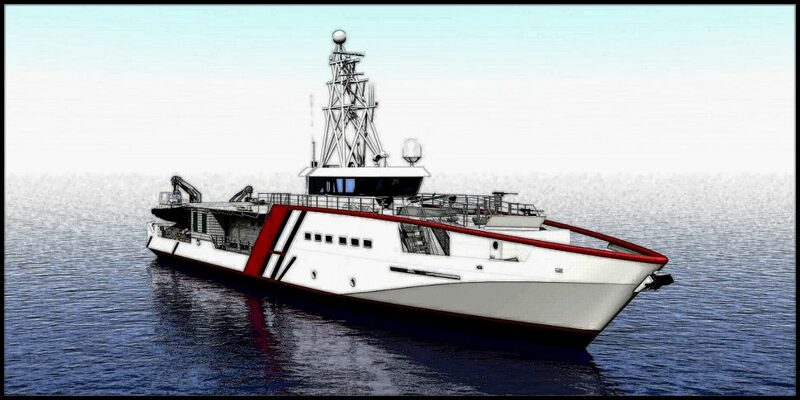 The vessels shall be used in a large project in West Africa whereby they shall monitor and secure the national waters. The vessels are scheduled for delivery later this year.